The preservation of flowers is an old art that dates back to colonial times. It continues to be popular as preserved flowers can be enjoyed for many years. There are several different ways of preserving flowers including hanging, pressing, and using drying agents. When looking for flowers to preserve, the best time to gather them is in the late morning. This will assure that the morning dew has dried but the afternoon heat has not yet set in. Plants that have excessive moisture can grow mold during the preservation process so you want to make sure they are dry. That being said, fully hydrated plants and flowers will preserve the best. Hanging - Hanging, or air drying flowers is the easiest and one of the best methods for preserving flowers. Generally, you will want to remove the leaves and hang the flowers upside down in a dry, warm, dark place until the moisture dries out. A closet, attic, or pantry, would be a good place to hang flowers. Areas that could experience dampness, such as basements, should be avoided, as damp conditions can ruin the flowers. When hanging flowers, they should be divided into small bunches to avoid them being crushed. The stems can be tied together with floral wire, twine, rubber bands or anything gentle enough to hold them together while keeping the stems intact. The flower bundles can then be hung from a nail, coat hanger, or some other object that will hold them. Hanging flowers to dry them normally takes one to two weeks depending on how moist the flowers were to begin with. Pressing - Pressing flowers is another common method of preservation. To press flowers, gather some unglazed paper (newspaper works well). The flowers should be spread out so that the petals do not all overlap and should be carefully laid between several sheets of newspaper. The flowers should then be pressed with a heavy object such as a book. There are also flower press machines that can be made or purchased. When flowers are pressed, the drying time is normally anywhere from two to four weeks. Pressed flowers should be handled carefully as once dry they are very delicate. Using Glycerin - Glycerin is a chemical that can replace water in plant material, resulting in a supple, long lasting plant. 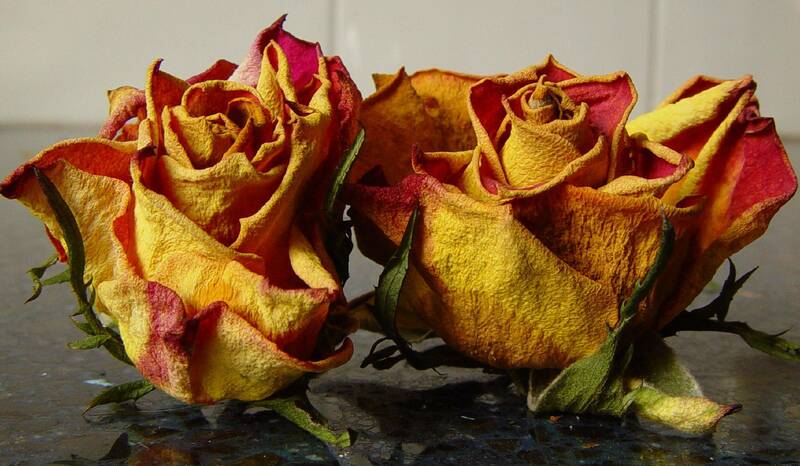 In order to preserve flowers with glycerin, they must be fully hydrated and not wilted at all. Mix one part glycerin with two parts luke warm water. The amount of time this process takes varies but it usually takes at least two to three weeks for the solution to reach the tips of plant leaves. Once removed from the glycerin, if the plant looks a bit wilted, it can be hung upside down so that the glycerin can continue to travel to the leaves and branch tips. Drying Flowers - There are several different agents that can be used to dry flowers including sand, silica gel, the microwave, and homemade mixtures. Microwave - Drying flowers in the microwave is becoming more popular. Because different flower species vary in moisture content, density, and texture, care should be taken when microwaving flowers and only one species should be done at a time. Due to the fact that microwave drying is a fairly new preservation method, there is not a lot of data available so care should always be taken when using this method. Sand - Very fine, dry, clean sand can be used to preserve flowers. It is recommended that the sand be sifted before use to remove any foreign particles and coarse grains. It may also help to rinse the sand multiple times to ensure that it is clean. You can actually dry damp sand in an oven by placing it in a shallow pan and baking for 20 to 30 minutes at 250 degrees. To dry flowers with sand, place a couple of inches in a container. Create a small depression on the surface of the sand and place the flower head upright in the depression. Next, press the sand around the outside of the flower to provide support. The next step is to scoop up a bit of sand and allow it to trickle out of your hand and around each petal. Drying flowers with sand causes them to be extremely fragile and care should be taken when handling to keep them intact. Silica Gel - Silica gel can easily be found in many nurseries, and garden centers. It is a granular compound that absorbs moisture rapidly. Due to rapid moisture absorption, flowers dried in silica gel tend to have their colors preserved better than with other methods. When using silica gel, most plants will dry within 36 to 48 hours. Silica gel can then be dried and reused for other flowers. Homemade Mixtures - There are multiple homemade mixtures that can be created to preserve flowers, and many of the ingredients needed can be found right in the kitchen. Yellow corn meal mixed with equal parts powdered pumice, or yellow corn meal mixed with equal parts borax can be used. Each of these mixtures should also have three tablespoons of non-iodized salt added to them. Some grains such as Cream of Wheat can be substituted for corn meal but will be heavier. Drying flowers with homemade mixtures usually takes approximately two weeks.